It’s that time of week again: Monday! Que the groans, right? WRONG! Mondays don’t always have to be negative, especially if you already have your daily meals planned out. Now you can coast through the day without any problems and get over those Monday morning blues. How? The secret is meal-prepping. Now I’ve written a few things on meal-prep before: Meal Prep 101, The Trick to Eating Well All Week, and Your Weekly Grocery List. But I thought I could walk you through a sample week just to eliminate some of the confusion I’ve been hearing from readers. I usually don’t incorporate dinners into my meal-prep because I’ll cook those at home or use leftovers. The real prepping deals with during the day because I’m out of the house and need to have things packed and portable to take with me. When you start to plan for a week, think of the main staples you’ll need to get you through. That’s typically 3-4 main entrees. You can make these or use leftovers. The remainder of the food will circle around these main staples. Monday [First stack]: salad, tuna (I’ll make a tuna salad, but I keep the tuna separate so it doesn’t make my lettuce/spinach soggy), chicken soup. Foil = salad dressing container. Red container = blueberries and yogurt. Tuesday [Second stack]: Chicken soup, turkey wrap, hummus, and chips. I’ll also add a yogurt and probably peanuts for a small snack. Wednesday [Third stack]: Mexican chicken, salsa verde, tortilla scoop chips. These will be eaten together, like a Tex-Mex chip mix. I’ll also add a yogurt and some fruit, maybe apples and peanut butter. 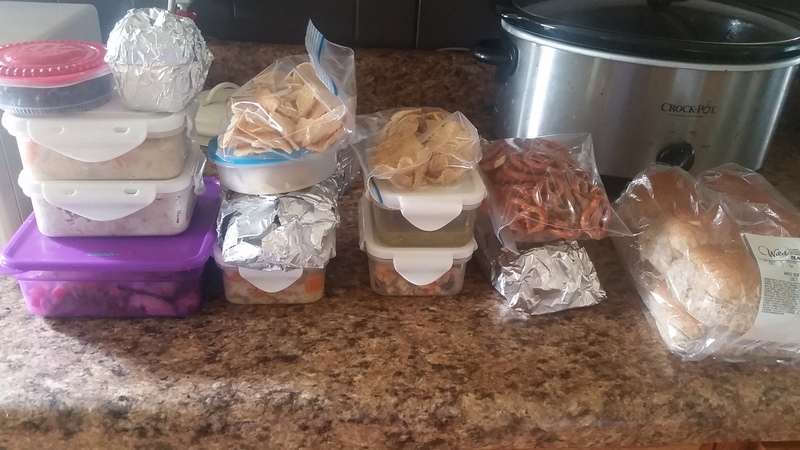 Thursday [Fourth stack]: Enchilada (leftovers), peanuts, fruit, pretzels. I usually prep on Sunday during the day, that way I’m free for the rest of the weekend and I can just grab my meals on the go! In each daily stack, I try to get fruit, veggies, carbs, and protein. I also try to have one main meal (ex: soup and salad) and have snacks around that main meal so I’m eating about every 2 hours. Also, I usually eat breakfast at home/my first job, so that’s why I don’t have a breakfast meal pictured. Adjust your meals accordingly, and if you have any questions, comments, or suggestions, please feel free to comment below!